But back when the traps were dropping on Green Mountain State scaffolds, no consideration of sentiment (or holiday pay) barred hanging a man on New Year’s Day, as occurred in 1892. You could call Sylvester Bell a ladykiller. According to family genealogists familiar with the case, the Canadian-born farmer used two of his wife’s relatives as character witnesses in his naturalization proceedings … and eight months later, shot said wife, the mother of his five children. Not only did Sylvester win acquittal for this non-fatal attack, Marcia Farnsworth Bell actually had to fight to get a divorce on the grounds of “intolerable severity”. Marcia and her unmarried children moved to Randolph, Vt., where the kids opened a major department store. Nothing daunted, a then-54-year-old Sylvester remarried the decades-younger Emma Lock (or Locke) in 1887. 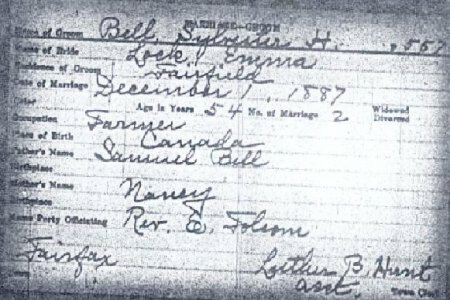 ‘Til death do us part: Sylvester and Emma’s marriage certificate. We may imagine an ensuing union not altogether free of discord,* as we rejoin the public record of their lives with the Jan. 2, 1890 Burlington Clipper. It appears that Mrs. Bell had left her husband and applied for a divorce. Thursday she, in company with Deputy Sheriff Hall, went to the house to remove her things. Bell met them very pleasantly and permitted her to pick up her goods. As she was about ready to leave she went up stairs and he followed her. Soon afterward a pistol shot was heard and Officer Hall rushed up, and Bell met him at the door of the room into which Mrs. Bell had gone and handed him the pistol, saying, “Take this. I have done the deed.” The ball entered the head of the unfortunate woman, just back of the ear, and she lived about thirty minutes, unconscious. Bell was put under arrest and for a time the excitement, and sympathy was so strong for the murdered woman that it looked as if Bell would be lynched, but the law will now be allowed to take its course. The course of the law will not hold much suspense for readers of this blog. The novelty of the eventual New Year’s execution attracted the New York Times which (botching the hanged man’s name and the date of his crime) reported the scene from the scaffold, where “Stephen” Bell bought himself an extra 34 minutes in this vale of tears with the verbosity of his last statement. WINDSOR, Vt., Jan. 1. — Stephen H. Bell was hanged here this afternoon for the murder of his wife, in the town of Fairfax, Dec. 26, 1880. At 1:40 the door of the west wing of the prison was closed and at 1:44 the prisoner was taken from his cell, where he was holding an earnest conversation with Chaplain Wassall. Bell, rather pale and tremulous, stood erect, and after addressing the Sheriff and officers in charge, asking for all the time he wanted in which to speak, began a talk which lasted thirty-four minutes. It was a rambling statement, in which he declared his innocence. When he had finished, Bell stepped back to his chair. Sheriff Lovell took him by the arm, and the condemned man stood up bravely. When Deputies How and Randall had pinioned his wrists, arms, and legs Bell stepped on the drop and said: “Gentlemen, I am a dying man; good-bye.” Instantly the Sheriff touched the spring and the drop fell. In fourteen minutes he was pronounced dead. The body was buried in Windsor Cemetery. Interestingly, Bell was the only person executed in his state during a 22-year period from 1883 to 1905. That span is bookended in Vermont’s death penalty annals by the first woman hanged in Vermont and the last woman hanged in Vermont. Bell’s descendants continue to seek information on Sylvester; anyone who may know more can get in contact via this author. * Another report of the murder describes Emma fleeing to live with her parents on account of Sylvester’s repeatedly menacing her with a butcher knife and a gun, until the “overseer of the poor, after a time succeeded in getting them together again, he giving up his pistol and agreeing to behave himself.” Clearly, it was a different time for domestic violence victims.